A new policy statement from the American Academy of Pediatrics provides best practices for ensuring safe transportation of medically fragile students on school buses. A dozen authors participated in publishing “School Bus Transportation of Children With Special Care Needs,” which was released on April 30. The document closely mirrors the most recent update to the “National School Transportation Specifications and Procedures” adopted at the 2015 National Congress on School Transportation. Dr. Joseph O’Neil, a professor of clinical pediatrics in developmental pediatrics at Riley Hospital for Children at the Indiana University School of Medicine, and a past presenter at the TSD Conference, is credited as a lead author, alongside Dr. Benjamin D. Hoffman of Oregon Health & Science University in Portland. Shutrump said she appreciates the paper’s emphasis on the importance of physician involvement in the development of a student’s individualized transportation plan. “Detailing specific recommendations, along with citing the standards and best practice guidance documents and resources which support them, should allow physicians and primary care providers to get up to speed on the safety issues they need to address when giving advice on transportation safety of students with special needs,” she explained. However, she pointed out that medical personnel should be considering transportation safety needs when ordering and prescribing wheelchairs, seating systems and related equipment, because WC 19 and WC 20 compliance standards allow for very limited retrofitting of existing equipment. 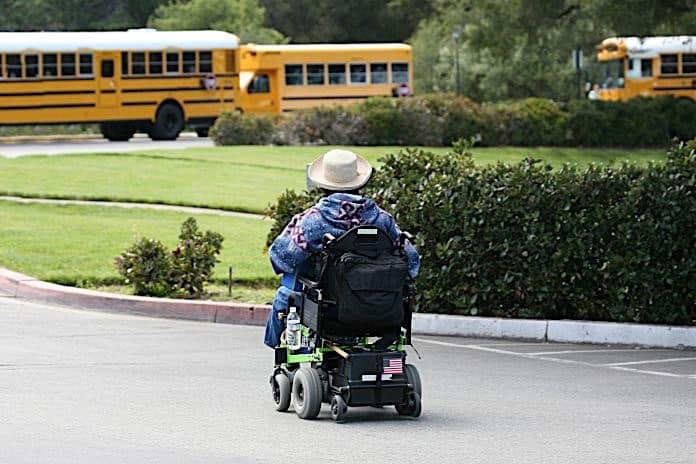 Shutrump stressed that physicians need to be “aware of the availability of compliant equipment and the need to require it in their initial prescriptions.” That should “greatly increase the number and safety of students riding school buses in compliant wheelchairs,” she said. While admitting that the implementation of the recommendations can be expensive and cumbersome, Shutrump said she will be forwarding the paper to families, district staff and others who ask for the documentation to support best-practice procedures for the safe transport of students with special needs. “It’s so useful to have this guidance from the AAP, which is known for providing the gold standard in care for all students,” commented Denise Donaldson, owner and publisher of Safe Ride News Publications. She said the update recognizes the growing number of children with special needs in schools who are entitled under federal law to receive special transportation accommodations. “The policy not only describes how to safely secure students who must ride in a wheelchair on the bus, it also recognizes, that for many of these children, it would be appropriate and safer to transfer them to a child safety restraint system during transport,” said Donaldson, who served as an editor of the paper prior to its publication. Dr. O’Neil is expected to return to the TSD Conference held in Frisco, Texas next March, to further discuss the paper and how it can be used by the student transportation community. “This comprehensive American Academy of Pediatrics policy addresses school systems’ responsibility for ensuring that children with special needs are safely transported in all forms of ‘federally approved transportation [that is] provided by the school system,’” commented Linda F. Bluth, Ed.D., a past-president of the National Association for Pupil Transportation and a quality assurance specialist for the Maryland State Department of Education. She noted that the transportation responsibilities specified in the Individuals with Disabilities Education Act (IDEA) are especially for children with qualifying disabilities from birth to 21 years old. “The importance for qualifying families of children ages 0-3, to receive safe transportation is discussed in relationship to the Individualized Family Service Plan (Part C) in detail,” she added. With more than 50 years of experience as a special educator, including 36 years in special needs transportation, Bluth acknowledged the importance of using the Individualized Education Program process focused on the educational needs of the child. This process includes involving parents, school transportation directors and school nurses, in conjunction with physician orders and recommendations for children who have specific care needs, which are also highlighted in IDEA, Part B. “Additional important information in the update includes using a transportation plan for children of all ages who have special needs, describing what is the correct securement for children in wheelchairs, as for children who require safety restraint systems,” she described. In conclusion, Bluth observed that the paper “thoughtfully presented” all federally required transportation standards and best practices. She called the document mandatory reading for all school personnel who are responsible for making transportation decisions. Founded in 1930, the AAP has approximately 64,000 professional medical members nationwide.